Roll it. Write it. Read it. Talk it. Several months ago, I talked about the distinction between world space and screen space. As a recap, these are fundamental concepts that separate our game or simulation state from our drawn or rendered state. What gets drawn to the screen is not necessarily how things are laid out in the game’s actual (world) state. Check out the previous articles for more information. The concept of tile picking involves a user hovering their mouse or some other input device over a tile in the game map. Usually the user is doing this in order to interact with the tile such as moving a unit to a location, placing an item on the tile, or inspecting the metadata of the tile. Fortunately for the developer, the process of picking is independent of the projection other than some simple math to do a conversion of coordinates. Imagine that you are playing SimCity 2000, and you want to create a stretch of road from one location to another. The process involves the user hovering the starting tile, clicking the mouse, dragging the road to the end tile, and releasing the mouse. Tiles were picked out of the game map based on the mouse’s coordinates during game updates. Which space do we pick the tile from? Do we have to calculate if the mouse is contained within the projected tile or within the game’s world space coordinates? To explain briefly, we get the position of the mouse (I use SDL which has a function to get the mouse position). We then convert the coordinates from screen space into world space. Finally we get the tile that is stored in our tile collection at the world space coordinates. 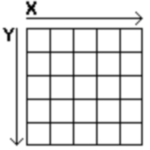 We floor the coordinate conversion because landing in the middle of a tile will result in a partial index. Reference the grid to the left. For the sake of discussion, let us assume that each grid contains 16 x 16 tiles. The top left most pixel is located in world space [0,0] and at screen space (0,0). The top right most pixel is located in world space [5, 0] and at screen space (80,0). If the user moves the mouse to the screen space coordinate (25, 50), then the math to calculate the picked tile is as follows (using the aforementioned technique). If you are not familiar with tile maps, please see the previous article in this series before reading this article. A space is simply some collection of points, vectors, shapes, and other objects that we use to store the state of our game or simulation. There are various kinds of spaces that can be employed during game development, but the two that I will focus on for this article are the concepts of world spaces and screen spaces. It is important to know the distinction and differences between these two spaces because it will make your game development journey much clearer and easier. Personally, it took me awhile before the concept of separating the spaces really “clicked” for me. The most commonly understood space is the world space of the game. This is the space that contains the positions of all entities in the game. 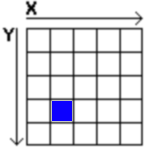 For example, if we have a 5 x 5 tile map where each tile is 16 x 16, we can represent that map (as discovered in the previous article) as a two dimensional array where [0, 0] is the first tile and [5, 5] is the last tile. Where these tiles are drawn on screen is of no importance when you generate the tile indices in the representative array. The underlying world of your game is represented by this array. The entities live their lives in this boring, mundane, grid-like existence. All the game interactions and logic take place within this world space because of how extremely simple and efficient it is to perform calculations if we assume our game is as simple as an evenly laid out grid. But when we plays most tile based games, we notice immediately that what we interact with certainly is not as boring as the pictured world space to the left This should make sense to you after thinking about it for a little bit. Think of games like SimCity, Diablo II, or The Legend of Zelda. Even though each of these games has different views and projections, they can still be represented by a very simple tiled world space. So what about those various projections then? If games that rely on tiles are nothing more than glorified arrays, how do games get those pseudo 3D effects complete with movement, collisions detection, and tile selections with the mouse? This is where the screen space comes in to play. The screen space is nothing more than a visual representation (via rendering) of the underlying world space in which our entities live. In my free time, I’ve been developing a Windows 8 app to view Steam-related information (news, deals, community profiles). I just got notification that my new app was approved and listed on the Windows 8 store. You can search for it directly in the Windows Store or see it online. The Steam Community Viewer allows users to search for Steam Community profiles to view profile details, game lists, game statistics, achievements, friend lists, group lists, and more. All data is obtained through public and Valve supplied methods. This application is not associated with Valve Software. This is just a first release, but I’m hoping to add a lot more functionality as I continue to develop it. I have been developing software professionally for about 5 years now, and I have been playing video games nearly my entire life. The combination of the two is something that I decided to tackle back in July of this year. Having never programmed for anything other than enterprise software, I decided to ease my way into the scene via XNA. I was already familiar with C# through my work, so it was an obvious choice to learn the basics and dip my toes into the ocean of game design. Since I am a full-time employee, I usually only get nights and weekends to work on this project. I would love to dedicate all my time to the development of my first game, but I am constantly reminded that something has to pay the bills. Anyway, you did not come here to read about my life; you came to read about my game! I have quickly learned that game development calls for many different talents. Some of the requirements include skills that I simply do not possess. Namely, I have trouble producing quality art, sound, and music. Since I am in this alone (for now), I have to rely on the wonderful open source community to fill this important gap. I can handle the technical side no problem, but when it comes to art, yikes. Without further ado, here is my game. The Chains of Acadia is a story of a hero. Oh, wow, how original. The thing is though, Acadia (the hero), does not know that he is a hero. When he finds out the truth, he probably will not want the status bestowed upon him. I do not want to ruin the story, so I will stop there and simply explain the style of play involved. The best way to describe the style is to picture Smash TV mixed with a slight bit of Touhou and some minor RPG elements. Take this image from my Twitter account for example. You can see that the player is constricted on four sides by the walls of the screen. Not every screen will have this type of layout, but it will be the most common. The player has to complete several waves and challenges to proceed to the next screen. Remember in Zelda dungeons when going through a door would slide the camera to the next screen? This is similar. I was recently experimenting with game state transitions and attempting to unload content when a screen was no longer needed. For example, I had a main menu screen which loaded assets to its own ContentManager on activation and unloaded the content when the screen transitioned off based on user input. This all worked fine until the main menu was asked to transition back on after the user was done playing the game. What I found is that calling the ContentManager’s Unload method will call the Dispose method of all the resources for which it is responsible. You do not and should not manually call the Dispose method for content that has been loaded. However, a problem arises when you want to reuse something that has been unloaded without reinitializing the ContentManager. Even worse, the problem arises even if you call the Load method for a piece of content after it has been Unloaded. This is the second article about building an XNA game installer when you are ready to distribute your game to the masses. In the first part, I described how to use the convenient ClickOnce option to build a relatively simple and non-customizable deployment package. If the ClickOnce option is too restrictive for you or simply does not meet your needs then you should refer to this article about using a Setup Project to create a more customizable installation package. As with most things in life, the Setup Project is not a perfect solution to packaging up and distributing your game. What I find extremely annoying and shortsighted on Microsoft’s part is that the Setup Project will not automatically detect your game content like ClickOnce does. I want to be clear that, in this context, “content” is referring to your compiled content by the Content Pipeline (textures, sounds, other files) and not the “content” of your project as a whole. I will explain how to force the Setup Project to use your game content. Be warned: it is tedious and annoying, but it works..
You just created a setup project, told it which prerequisites are needed for your game to work, and finally told it which build output you want to include in the installer. You can arrange the “File System” folders to how you see fit for your application folder hierarchy. For example, you should see options to include files in the User’s Desktop or the User’s Programs Menu in case you want to include shortcuts. Be careful not to abuse this though, because the user will not be happy if you dump 500 files on their desktop! This article is the first of two on how to package your XNA game into an installer for Windows environments. The first is the easier but less customizable option of using Visual Studio’s built in ClickOnce installer. ClickOnce is essentially a hand-holding tool to package up prerequisites, dependencies, manifests, and content. Additionally, it allows you to specify locations from which the users will install the package (CD, Web, Shared Drive). More conveniently, ClickOnce allows you to specify where the application should check for updates in order to automatically update the content when new versions of the application are released. For example, you could specify a URL that the application will use to check for new versions. If a new version is detected, you can specify either the same URL or a different URL to use for downloading the new content. While ClickOnce is easy to use, it is not perfect for every scenario and can fail quite spectacularly. I have personally run into situations where users could not install updates to the application because of cryptic errors that were only resolved by completely recreating a user account in Windows (I kid you not, this is a Microsoft-sanctioned approach). Many of the errors are difficult to diagnose and the documentation does not help much when it comes to the more advanced features of ClickOnce. It is definitely convenient, but do not use it if you want customization or extendability. That said, here is how you use ClickOnce to package your XNA game into an installer.